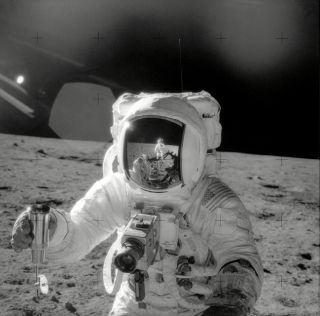 Astronaut Alan Bean holds a sample of lunar soil in a container. In this historical photo from the U.S. space agency, Astronaut Alan L. Bean, Lunar Module pilot for the Apollo 12 lunar landing mission, holds a Special Environmental Sample Container filled with lunar soil collected during the extravehicular activity (EVA) on Nov. 20, 1969, in which Astronauts Charles Conrad Jr., commander, and Bean participated. Connrad, who took this picture, is reflected in the helmet visor of the Lunar Module pilot.